The exhaust system is one of the most important elements of any commercial kitchen. The purpose of a kitchen exhaust system is to remove hot air and odors as well as safely eliminating vaporized grease, which is a natural byproduct of cooking. Naturally, cooking foods with oil results in more vaporized grease, so if your commercial kitchen fries or sautees frequently, properly maintaining your kitchen’s exhaust system is especially essential. Failing to keep your commercial kitchen exhaust system clean and in good working condition will compromise its ability to do its job properly. If your commercial kitchen exhaust system isn’t able to pull hot air, odors, and vaporized grease from your kitchen effectively, too much grease will build up in the system. Then you’ll run the risk of dangerous flash fires within your exhaust system ducts. If that happens, the fire department will have to be called, and you’ll have to shut down your business for repairs, resulting is plenty of lost income. Avoid a huge interruption to your business by proactively maintaining your commercial kitchen exhaust system. But what happens if you failed to maintain your exhaust system regularly, and it has stopped working well? Then you need to address the problem ASAP. But how? Anytime you have an emergency with your exhaust system, you can count on Flue Steam to help you out. Simply call us at 800-700-FLUE and we’ll send a technician over to make any and all necessary repairs ASAP. It doesn’t matter what day or time it is – we’ll provide impeccable emergency repair services for your exhaust system anytime. 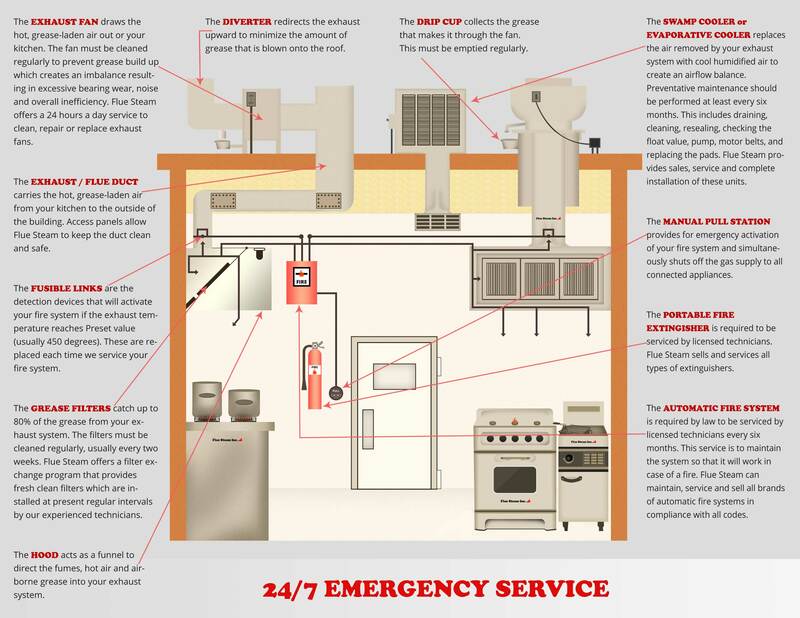 We hope you never have an emergency situation arise with your exhaust system, but if you do, count on Flue Steam for all your commercial kitchen exhaust system repair needs. There are many ways in which you can prevent an emergency situation from arising. Invest in regular equipment inspections and cleanings. Sign up for regular exhaust system cleaning services with Flue Steam and you’ll never have to wonder whether your system is clean enough again. Our technicians strive to reach every inch of your exhaust system to clean it thoroughly. Plus we provide various bonus services at every cleaning visit. Our technicians will grease your fan bearings, check the belts, and replace worn belts with new, customer-supplied ones whenever needed, all at no extra charge to you. 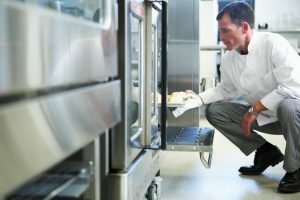 We recommend booking commercial kitchen exhaust system cleaning appointments at least one week in advance, but we can perform the cleanings at any time that’s convenient for your busy schedule. Begin your partnership with Flue Steam today by calling 800-700-FLUE. Sign up for regular commercial kitchen exhaust system cleaning services and any of our other helpful services.